All six points below are essential to interpret the above map correctly. The map above shows days-in-transit via FedEx Ground, for items shipped directly from Pleasant Hill Grain at Hampton, Nebraska. Please read the following important notes. FedEx's "day count" begins the day after the package is shipped out from our Nebraska facility. Examples: The map above shows that a package shipped by ground service with FedEx and leaving our facility on a Monday, will arrive in South Carolina or Washington State or Pennsylvania on Thursday, barring unusual problems. Most orders received by noon Central Time ship out either that day or the following business day. The FedEx day-count begins the following day. SPECIAL NOTE: FedEx delivers ground-shipped packages to business addresses Monday-Friday, and they deliver to residential addresses Tuesday-Saturday. So if the map above indicates that delivery would be made to your residential address on a Monday, the package actually will be scheduled to arrive the next day, on Tuesday. Because FedEx's shipping is at least 1 day faster than the service of competing carriers to many areas, this results in equal-or-better service for our customers, with the added benefit of Saturday delivery service to residences. If your circumstances allow you to have your items shipped to a business address rather than to a residence, FedEx will then deliver it on a Monday if that's the day indicated on the map, above. (Note that delivery to a residence where a home-business is conducted, is classified by carriers as a residential delivery.) Also, note that for either residential or business delivery, the days that count toward transit time are the same days of the week on which deliveries are made for that service. So, for shipments to residences, Mondays do not count as a transit day and for shipment to businesses, Saturdays do not count as a transit day. Christmastime note: FedEx does make deliveries on Christmas Eve day except (for FedEx Home Delivery) when Christmas Eve day falls on a Monday. FedEx does not make deliveries on Christmas Day itself. Most orders placed online are shipped via FedEx Ground shipping, except that some small items are shipped by US Mail. To pay for faster premium shipping service OR to request shipment by U.S. Mail, call 866-467-6123 to order (see phone hours). Pleasant Hill Grain stocks over 97% of what we sell, but a few products, (primarily large commercial products) are shipped directly from manufacturers' facilities. Call or e-mail for transit times for commercial products. Manufacturers may use shipping services different from those used by Pleasant Hill Grain for stocked items. 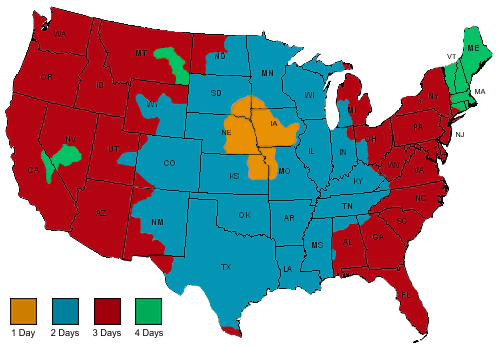 This transit-time map does not apply to items shipped by truck freight. Pleasant Hill Grain, by default, does not require a signature for packages delivered by FedEx Ground service. If you want a signature to be required for delivery, the "Comments" field in the shopping cart is the place to request that. The delivery days quoted in the table above are exclusively the commitment of FedEx. On rare occasion a shipment can be delayed by a day or more, and after the shipment has left our premises, Pleasant Hill Grain cannot physically control it; however, FedEx has proven to meet their delivery schedule very reliably and consistently. For orders that ship by FedEx, a tracking number will be e-mailed directly from FedEx to you the evening of the day the item ships out.